This is the decades-old SERENDIPITY 3 on 60th Street, not far from where I live. This image was taken last month before Christmas. Part general store, part ice cream parlor, and part casual restaurant, this place is always crowded, and has been a favorite dessert hangout for over two decades, for both locals and such celebrities as Tom Cruise and Cher. In Helen Zelon's review: "The restaurant is primarily a dessert spot, but the food--which is served in portions as generous as the desserts--is simple and tasty, from soups, salads, crepes and pasta to hot dogs and burgers. Nonetheless, the real star remains dessert--sublime, sinful and massive. Aficionados swear by the frozen hot chocolate, made from no fewer than 14 kinds of chocolate ground into a rich slush. Linger over a root beer float or watch your banana split melt into milky oblivion--your kids will be blissed out in creamy sweet abandon." 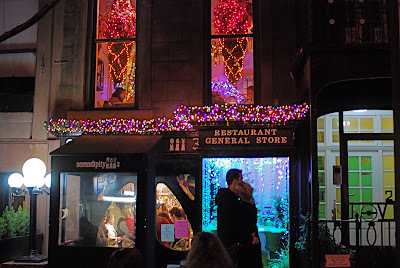 Serendipity 3 is located at 225 East 60th Street. Tel (212) 838-3531. YUM! I'll have to visit this place upon my forthcoming new trip to NY! Floral Design by DAVID TUTERA's "STEM"
Public Art: TONY ROSENTHAL'S "Rondo"